The purpose of your immune system is to keep the body safe by recognizing and attacking foreign substances, such as viruses and bacteria. An allergy develops when the immune system mistakes a harmless substance for a harmful one. When your body categorizes an allergen as harmful, it produces antibodies to that allergen. 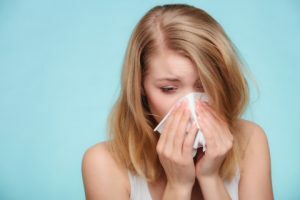 Each time you encounter that allergen in the future, the antibodies attack the allergen and produce chemicals that affect your skin, digestive system, airways, and/or sinuses. The symptoms you’ll experience when you have an allergy usually depend on the nature of the allergen. For example, inhaled allergens, such as pollen, may cause watery eyes, runny nose, stuffy sinuses, itching, and sneezing. Our practitioners will likely recommend a blood test after your initial appointment. This test can determine which substances are causing your symptoms so you can get the best possible treatment. With some allergens, you may be able to deal with the problem simply by avoiding the substance. However, other allergens are unavoidable and require more involved treatment. Some allergies respond well to medication, such as antihistamines. However, if you continue to have symptoms with medication, immunotherapy may be recommended. In that case, we can treat you with a purified form of specific allergens over a period of several months. The ultimate goal of immunotherapy is to help your body build an immunity to specific allergens so that you experience fewer symptoms down the road. At Hill Family Medicine, we understand that allergies can be both uncomfortable and life-disrupting, no matter what time of year it may be. Whether you need to talk to a physician about allergy medications or you’re interested in learning more about immunotherapy, our primary care physicians are dedicated to helping you lead a healthy, happy life. We believe that everyone should be able to access quality care, and that’s why our services are covered by most major insurance plans, including Medicare. Fill out the form below or give our office a call to schedule an allergy testing appointment.